Because of Alison's awesomeness (and because I'm not one to let my utter lack of grace keep me from attempting things I have no business doing), I found myself trying SUP Yoga at BayCreek Paddling Center on Tuesday night. What's SUP? Just standing all up on this paddleboard. Then paddling it out to the secret wilderness "yoga studio." And doing some yoga on it. It sounds scary, like one of those things that's reserved only for people with coordination and actual muscles. But even I could do it. And I'd never been on a paddleboard before, plus I'm sorely lacking in both balance and flexibility. 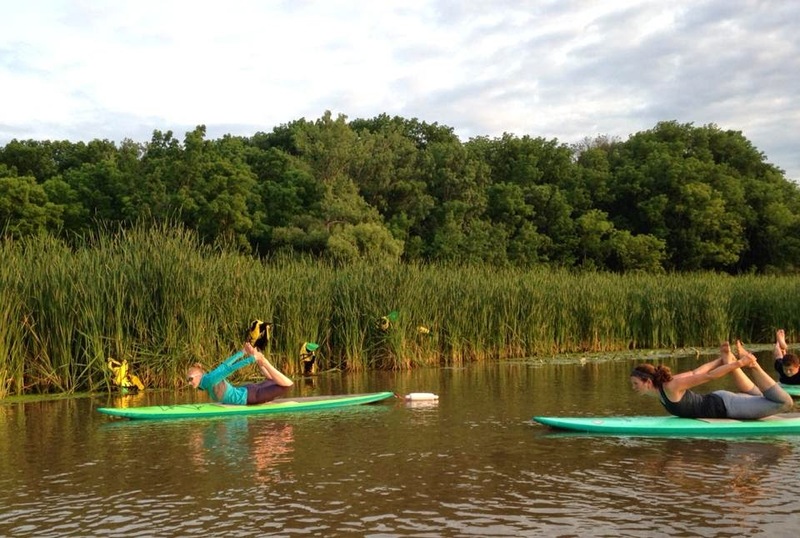 Basically, if you are alive, you can do SUP yoga. And you should. It's a very unique experience. It was a little tricky trying to keep my balance on the board, but I didn't feel like I was going to fall in at any point. And if it had been just a little bit warmer out, I wouldn't have minded a fall or two. Indoors, I find it very hard to discover my true self or be one with the universe or whatever it is you're supposed to do during yoga. But outside on the water it was very peaceful and relaxing. The only thing I didn't like was that my board smelled a bit swampy, so the facedown poses weren't my favorite. So it goes. Sometimes when you venture outside your comfort zone it gets a little stinky. But it's a small price to pay for new adventures. I also really want to go regular SUPing now. Perhaps a SUP and supper night. I wish adventuring could be my full-time job and my actual job could be my part-time job. So here's what's SUP, Doc: If you go to SUP Yoga, all you need to bring is a sense of humor, an open mind and bug spray. One of the other yogis was wearing these awesome polka-dotted yoga capris, and I would totally bring those too if I had them. Lyric of the moment: "Here we go, going in alone into the dark and wonderful unknown. Let us go, let us go. In the best way, you’ll be the death of me..."